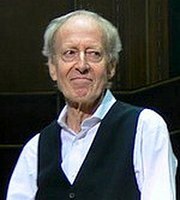 John Barry Prendergast, OBE (3 November 1933 – 30 January 2011) was an English composer and conductor of film music. He composed the scores for 11 of the James Bond films between 1963 and 1987, and also arranged and performed the “James Bond Theme” to the first film in the series, 1962’s Dr. No. He wrote the Grammy- and Academy Award-winning scores to the films Dances with Wolves and Out of Africa, as well as the theme for the British television cult series The Persuaders!, in a career spanning over 50 years. In 1999, he was appointed OBE for services to music.